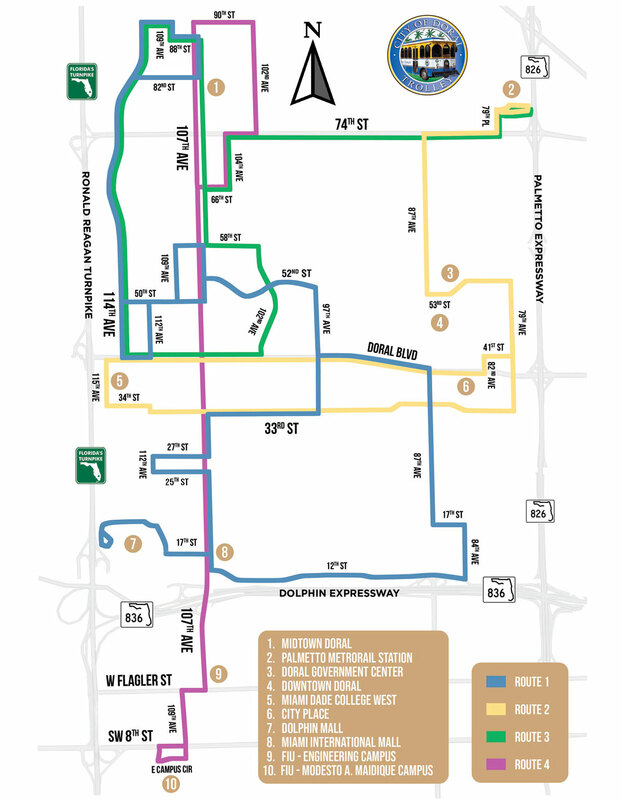 Your Doral Trolley Tracker provides real-time trolley information for all Routes. Unlike traditional trolley schedules, Doral Trolley Tracker lets you see and track the actual status of your trolley, so you know when your ride will arrive. Instead of waiting at the trolley stop, use Doral Trolley Tracker to help you plan your time – run another errand, finish up another project, or simply wait indoors. Using Doral’s new Mobile Application from "TSO MOBILE" you will be able to take advantage of an entirely new, Redesigned Mobile Online Tracker that will take you by the hand and guide you to your next Destination on-board Doral’s New "Old Fashioned" City Trolley’s. This application takes the Original Trolley Tracker to the Next Level. Service Exceptions Note: REMEMBER THAT SCHEDULED TIMES ARE APPROXIMATE; PLEASE TRY TO BE AT YOUR TROLLEY STOP 5 MINUTES BEFORE THE SCHEDULED TIME. The system that provides trolley location information to the Doral Trolley is not always able to show accurate trolley locations or arrival times when trolley is substituted due to operating conditions that are beyond its control or during adverse weather conditions. We apologize for any inconvenience this may cause. You are encouraged to call City of Doral Public Works Department for information Doral Trolley when the system is not able to locate the trolley.